Vernon K. Belik, 93, of Prague, died Saturday, May 5, 2018, at david place in David City. Mass of Christian Burial Wednesday, May 9, 2018 10:00 A.M.
Vern was born September 25, 1924, in Prague, Nebraska to Kazimir and Verona (Pabian) Belik. He attended Prague schools and graduated from Prague High School in 1942. On June 20, 1946, he married Marie Lanc at Holy Trinity Catholic Church in Brainard. Vern lived his entire life in Prague and was a farmer. His true love was music. 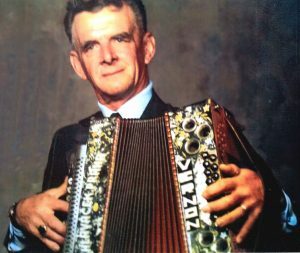 Vern was a musician/composer/arranger of Czech music and was a true advocate for keeping the tradition alive. He was a Master Button Accordian Player and also played the saxaphone. Faith and family were very important to Vern and music was his gift. Vernon is survived by his wife of 71 years, Marie Belik of Prague, daughter Darlene (John) Spicka of Weston, two sons; Donald Belik and Eileen Soukup of Lincoln and Daniel (Dawn) Belik of Omaha, six grandchildren; Brian (Michelle) Spicka, Scott Spicka, Jeffrey, Cory, Christopher and Kira Belik and three great-grandchildren; twins Sam and Molly Spicka and Emma Spicka. He was preceded in death by his parents and a daughter, Donna Jean Belik.